For the past 50 years, INTF, the institute that produces the NA and now UBS editions, has published “reports” (Berichte) on their text-critical work. I came across these by accident one day at Tyndale House and discovered that they are a treasure trove of information about the Institute’s work. For those interested in the recent history of our discipline, they are often essentially reading. The Institute always gave these away free, but sadly they couldn’t find any extra copies when I was last there. I had actually hoped to scan all these before leaving Cambridge, but I ran out of time. Now someone else has done it for me. Klaus Wachtel has just send word that the full set is now online at INTF’s website. Many, many thanks to whoever was responsible for scanning these! What kinds of things are in these? Is it just reports on the work of INTF? Or are there additional articles? And, if the latter, are any in English, and is there any good way to search the whole lot at once, or large parts at a time, like multi-year indices, etc.? That’s so cool! I believe, it was just a question of time, INTF was going to make those “Berichte” online (that have should happend earlier of course). It might be very helpful to speak and read German language in order to get every information that those “Berichte” have. Some articles from Barbara Aland are published in English (e.g. 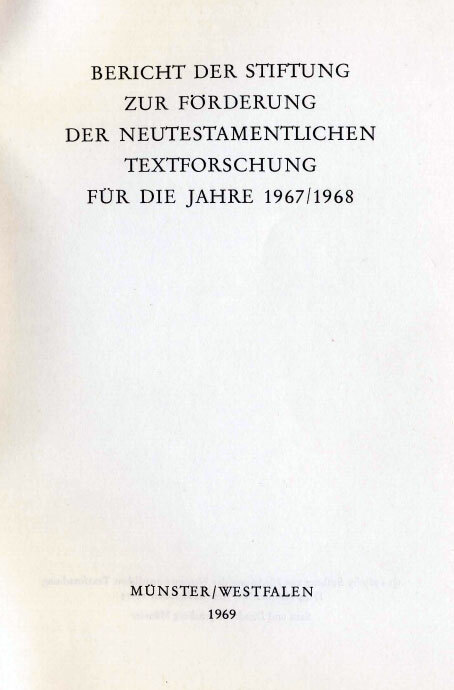 “A new instrument and method for valuating the total manuscript tradition of the New Testament” (in “for the years 1985 to 1987”, Münster 1988, pages 33 - 50). 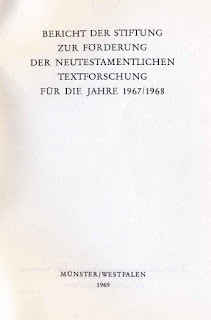 But the most interesting article and an absolute must-read for me was the one from Kurt Aland himself in “for the years 1982 to 1984”, paged 9 – 75, titled “Die Grundurkunde des Glaubens - Ein Bericht über 40 Jahre Arbeit an ihrem Text”, where he describes his work of the past 40 years very detailed. I was very surprised to read, that the “Liste” –when Aland started his work in the 1950s- had only 4250 listed manuscripts. Up to 1983 (the year when this article was printed), the total number of manuscripts was raised up to 5460. What means, that the diligent people from INTF were able to find and add more than 1200 manuscripts to the “Liste”! All this is very essential material for all of us. Especially for those who would like to understand the history of all Nestle-Aland and UBS-Editions. Thanks, Anon. Anyone else who finds interesting material, please let us know.